Provides a high speed connection between HDMI-enabled devices - The HDMM12 High Speed HDMI cable (12 ft) features 2 gold-plated HDMI (male) connectors and durable high quality construction to provide a dependable HDMI to HDMI connection between devices such as Blu-Ray Disc players, HDTVs, DVD Players, stereo receivers, projectors and more. This high quality HDMI cable fully supports 1080p+ resolutions at up to 120Hz refresh rate, with life-like color. To accommodate the demands of future high definition devices, such as increased resolutions and higher frame rates, this Ultra HD cable supports resolutions up to 4k x 2k. This HDMI cable comes in a non-standard 12 foot cable length, allowing you to position your HDMI-enabled devices as needed and is backed by StarTech.com's Lifetime Warranty for guaranteed reliability. 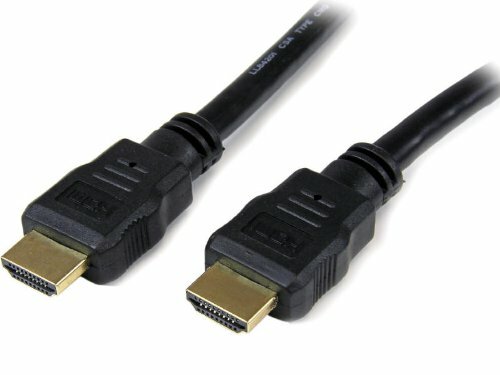 About StarTech.com HDMI to HDMI Cables: StarTech.com High Speed HDMI digital video and audio cables are expertly designed and constructed of only top quality materials to ensure high quality, high definition performance. The HDMI standard combines high bandwidth video and multi-channel digital audio into a single cable, and provides crystal clear image resolution. View More In HDMI Cables.